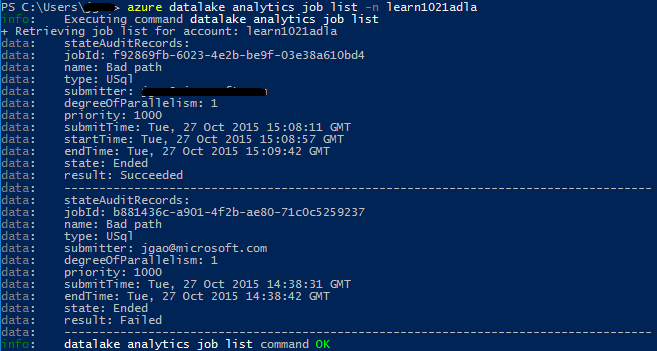 Learn how to manage Azure Data Lake Analytics accounts, data sources, users, and jobs using the Azure CLI. To see management topics using other tools, click the tab select above. Azure CLI. See Install and configure Azure CLI. Download and install the pre-release Azure CLI tools in order to complete this demo. Authenticate by using the az login command and select the subscription that you want to use. For more information on authenticating using a work or school account, see Connect to an Azure subscription from the Azure CLI. Before running any Data Lake Analytics jobs, you must have a Data Lake Analytics account. Unlike Azure HDInsight, you don't pay for an Analytics account when it is not running a job. You only pay for the time when it is running a job. For more information, see Azure Data Lake Analytics Overview. When you create an Analytics account, you must designate an Azure Data Lake Storage account to be the default storage account. The default Data Lake storage account is used to store job metadata and job audit logs. After you have created an Analytics account, you can add additional Data Lake Storage accounts and/or Azure Storage account. You can view the default Data Lake Store account used by running the az dla account show command. Default account name is listed under the defaultDataLakeStoreAccount property. Only Blob storage short names are supported. Don't use FQDN, for example "myblob.blob.core.windows.net". You must have a Data Lake Analytics account before you can create a job. For more information, see Manage Data Lake Analytics accounts. The default priority of a job is 1000, and the default degree of parallelism for a job is 1. Use the list command to find the job id, and then use cancel to cancel the job. Use the az dla job pipeline commands to see the pipeline information previously submitted jobs. Use the az dla job recurrence commands to see the recurrence information for previously submitted jobs.